Icona has confirmed the first fully developed version of its Vulcano Titanium will be revealed at Salon Privé. Described as the world’s first titanium hyper car, the Vulcano Titanium will be shown at the Salon Privé Concours d’Elégance 2016 event, an annual gathering of the most exclusive cars in the world. The one-off Vulcano Titanium is a completely unique car, inspired by the world’s fastest plane, the titanium-made SR-71 Blackbird. With a streamlined silhouette, from the outset the initial idea for the Vulcano was to use a front mid-engine layout, with a ‘strongly sculpted’ body which would ‘evacuate’ the hot air from the engine and reduce the air turbulence generated by the wheels. The Vulcano uses a consistent theme of dynamic triangles set in horizontal symmetry, reminiscent of the brand’s logo, while the bare titanium body was built in Italy by renowned one-off and prototype manufacturer CECOMP, involving more than 10,000 hours of hand-crafted work. The high tech interior design has a racing-inspired feel and is made principally from carbon fibre, trimmed in Poltrona Frau Leather as well as black Alcantara. The driver is surrounded by screens including a large touch screen in the console, gathering together functions such as GPS, radio and car diagnostics but also air conditioning. A 12.3-inch TFT display configures a number of different modes and provides the driver with all key information in a digital format. The most important functions such as start, lights, indicators or windows remain analogue with ‘pilot’ functions such as an aero wing deployment switch found on the steering wheel. The drivetrain and suspension is the work of ex-Scuderia Ferrari engineer director Claudio Lombardi along with Mario Cavagnero, head of 'Italtecnica' and father of some of the most famous world champion race cars. Their combined experience and skills ensure that the Vulcano lapped the Nurburgring in under 7 min and 20 sec. The V8 supercharged engine generates its propulsion from a 6.2 litre displacement, producing a power output of 670 hp and a maximum torque of 820 Nm at 6,600 rpm, and is mated to a fast-shifting 6-speed single-clutch transmission which uses only paddles behind the steering wheel to change gear. With a power-to-weight ratio of 2.38 kilograms per hp, top speed exceeds 220 mph with a 0-62 time of 2.8 seconds. The Vulcano Titanium runs on lightweight forged aluminium, shod with Pirelli PZERO 285/30 ZR 20 on the front and 355/25 ZR 21 on the rear. The brakes are 6 and 4 piston calipers, and a Brembo carbon-ceramic brake system. 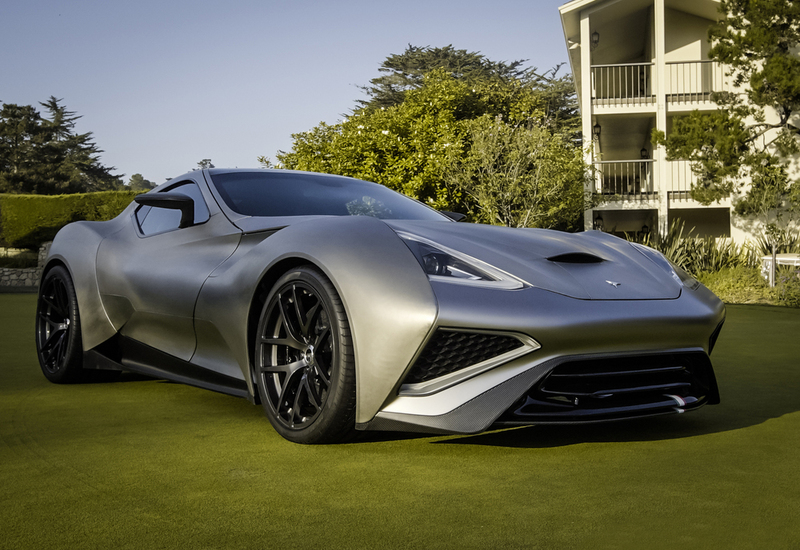 The Icona Vulcano Titanium is priced at 2,500,000 Euros, approx. £2,100,000 excluding taxes. Salon Privé at Blenheim Palace, runs from 01-03 September 2016.